With digital communication constantly evolving, it’s tough to know what is the best communication platform to use in sales. Some people no longer respond to personal phone calls favorably, while others get irritated with too much email communication. This leaves sales representatives playing a guessing game about the best way to communicate with their potential clients – should they use phone calls or emails? Both forms of communication, however, still have their place in the sales industry; the key is determining when to call, and when to email. Outside of visiting a client, nothing is as personal as a phone call. Everyone recognizes that making a phone call requires more time and effort from the sales person. Since prospects want to be catered to, this attention can be the factor that closes a sale with the prospect or ensures that they remain a client. Even cold calls can still be effective because the sales representative has the person’s attention on the phone; whereas a person could simply delete an email without reading the sales pitch. Hanging up on a person is far more difficult than deleting an email. Another factor to consider is that of personalization. With the prospect on the phone, the sales representative can listen to the personal needs of their lead and cater specifically to them. Phone calls allow the sales representative to get a better understanding of the prospect’s needs, questions, and purchase probability. One of the biggest benefits to using email in sales is that emails are time savers for both parties. They allow the sender to quickly send emails to all their prospective clients, giving sales representatives a bigger reach, and sales reps only have to spend a small amount of time personalizing each message. Calling each person, however, takes much more time and a sales representative cannot reach as many people in a day. On the receiving end, emails are far less invasive to people because they can choose to read and respond to them when they have time. 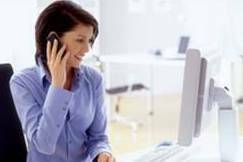 Phone calls don’t give people that flexibility, and prospects are less likely to be receptive to a phone call when they are busy or feeling stressed. Sales teams must find a balance between phone calls and emails that works for them and the company, and Salesforce can help with that. Salesforce allows representatives to log their activity and differentiate between phone activity and email activity. You can then run reports and looks back to see whether focusing on email works better for your leads or if your sales representatives should be spending more time calling all their prospects. Both phone and email are useful ways to communicate with potential clients, but you want to find the right ratio to help your sales team increase their win rate. [button type=”success” size=”lg” link=”http://bit.ly/1Aw2zvT”]Need Help Pinning Down Your Sales Process in Salesforce?